Tim: Wait just a minute. I’d like to update my Facebook page and add some more information to my profile. Selene: Wow, you really spend a lot of time on Facebook! I know it’s interesting to see what your friends are doing, but don’t you get bored after a while? Tim: Well, I don’t just use Facebook to keep in touch with my friends. I also use the site to network for work contacts. I’d really like to get a new job. I’ve joined some new Facebook groups connected to my job. Selene: Really? I’ve never thought of that and I’ve been on Facebook for about two years. I use it to see what my friends are doing. Tim: Well, these days more professionals are using social networking sites to network with other people in fields related to their jobs. Kitty: I’m trying to raise money for homeless people and I’ve started a volunteer group to collect donations and bring food to the homeless. Jolene: Really? That’s a wonderful idea! You should make a Facebook page for your group so that you can network with your contacts and get more help for your group. Kitty: You’re right! I didn’t think about that before, but I have a lot of Facebook friends, so networking for my volunteer group on Facebook might be just the thing we need to help our group grow. 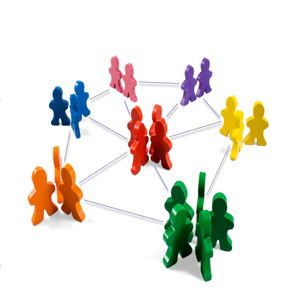 To Network means to meet or come in contact with other people to share information, contacts or other help or to communicate with and within a group. In the first example, Tim is using Facebook to network for a job. In the second example, Kitty is networking with all her friends on Facebook for a volunteer group that helps the homeless.